In recent news, high-profile African-American men have come out of the closet. 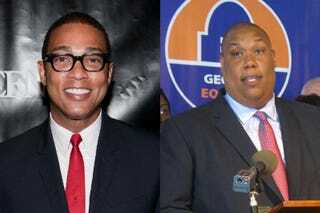 The latest to announce that they are gay are CNN News anchor Don Lemon and Georgia State Rep. Rashad Taylor, both of whom named homophobia in the black community as one of their reasons for previously staying quiet about the matter. When I first heard about their announcements, a couple of thoughts came to mind: 1) I was glad that they came out and 2) yes, homophobia is rampant — but not just in the black community. I understand their fears. But at the same time, I couldn't help worrying that some would think that homophobia is specific to our community as opposed to the world community, lessening the possibility of addressing the issue on a global scale. Some bloggers wondered if Lemon in particular had thrown black folks under the bus. I didn't see it that way. But I do think that in making his declaration about homophobia in the black community, he was inadvertently overlooking black women. Most of us love and support gay black men. But Lemon managed to group us with straight black men, many of whom (but not all) are homophobic. Sexism functions in the black community the same way that homophobia does — making black women, who are hypervisible in many spaces, including schools, churches and as heads of households, invisible by virtue of being black and female. Homophobia makes gay and lesbian blacks invisible by virtue of requiring heterosexuality as a characteristic of blackness. So when Lemon and Taylor named the black community as culprits in their decision to hide their identity, the voices of black women who support gay black men were silenced. While I don't believe that silencing black women was their intention, that was the result. When I speak of loving and supporting gay black men, I'm not talking about high-profile celebrity hookups or alleged "arrangements," like the marriages between Star Jones and Al Reynolds or Terry McMillan and Jonathan Plummer. I'm talking about the black women who are in the trenches with gay black men on an everyday basis, serving as confidantes, loyal friends and extended family members. I'm not talking about the sisters who complain that they don't have husbands because there are too many gay black men on the "down low." I'm talking about women who know that the "down low" is a marketing term that does not apply to all gay black men and is often used by the media to further demonize black men as if they are the only ones who are creeping. I'm talking about the mothers, sisters, aunts and cousins who always assumed that you were gay and could not care less about it. I'm not talking about women who called you the f-word out of fear and hatred or who prayed for you to become straight, knowing that you were gay all along. I'm talking about the black women who prayed for your happiness and wholeness so that one day you could be yourself because of the beautiful person you are inside. These are the types of black women I'm talking about, who get silenced when they are grouped into the larger category of the black community; we belong to that category but may not be of it in the way that Lemon and Taylor describe. Black women and black gay men have a special relationship. Whether you look at fan groups (Diana Ross or Lil' Kim, anyone? ), the church or local hair salons, by and large you find black women (gay and straight) and gay black men coexisting peacefully. My intention is not to use stereotypical representations of sexuality — merely to highlight the cultural spaces where black women and gay black men connect. I suppose in Lemon's and Taylor's comments, I wanted to see a space for women like me, who love and support gay black men. When Lemon and Taylor announced pubicly that they were gay, it reminded me of when my gay friends were able to do the same, and the freedom that came along with it. While I understand that their announcements were not about black women in general — the announcements were about them and their freedom — by implicating the black community, in my mind, they then became about black women's invisibility. There is a tradition of closeness between black women and gay black men that should not be overshadowed by membership in a complicated club. Nsenga K. Burton, Ph.D., is an associate professor of film and new media at Goucher College in the department of communication and media studies. She is editor-at-large for The Root.